Their qualities, values and significances. To use wazifahs, Quran Ayats, Asma-ul-Husna, etc. we should take priority in fulfilling our obligatory (fard) acts. Today, it is surprising, that we as Muslims neglect our Fard Salaah and then at times of worldly difficulty, we turn to Allah to take benefit from His words. Salah, obligatory on every Muslim should be given preference over everything. After fulfilling these Fard acts, surely our Dua’s will be accepted. Therefore be punctual in our 5 times Salaah in order to gain full benefit. If you wish to learn the 99 Names of Allah and commit it to memory watch 99 Names of Allah video to help memorisation. 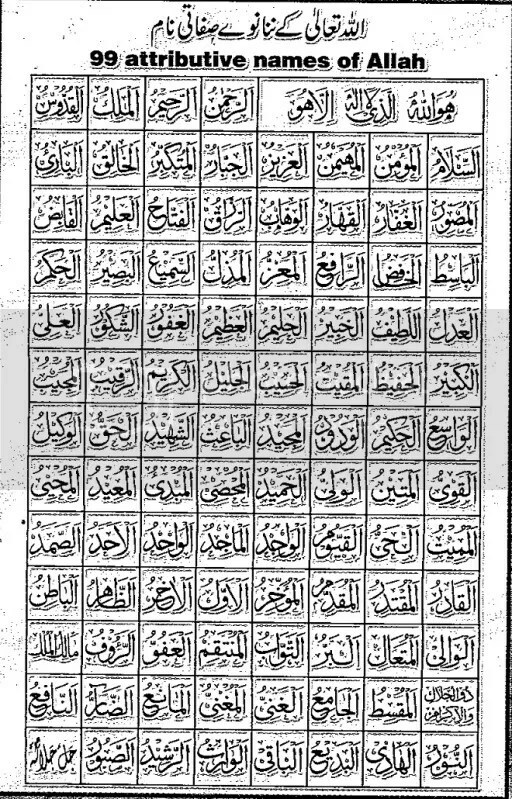 Below is also a image file of the 99 Names of Allah for you to donwload and use to memorise the Names as well.